Our world is full of stories of normal, every-day folk who, while living their daily lives, happen to have an encounter with something unknown, something "unnatural", something that defies rational logic and reasoning. Whether it be strange lights in the night sky, an animal or creature that is not known to modern "mainstream" science, or an encounter with a ghostly apparition or phantom-like being, stories have been, and will continue to be, told by people who, perhaps by chance, had a run-in with something they can't easily explain or comprehend easily. In the last 60 years a small number of stories have been reported of encounters with a strange humanoid creature, that many perceive as "monovalent", and has become linked with the enigmatic world of UFO folklore. 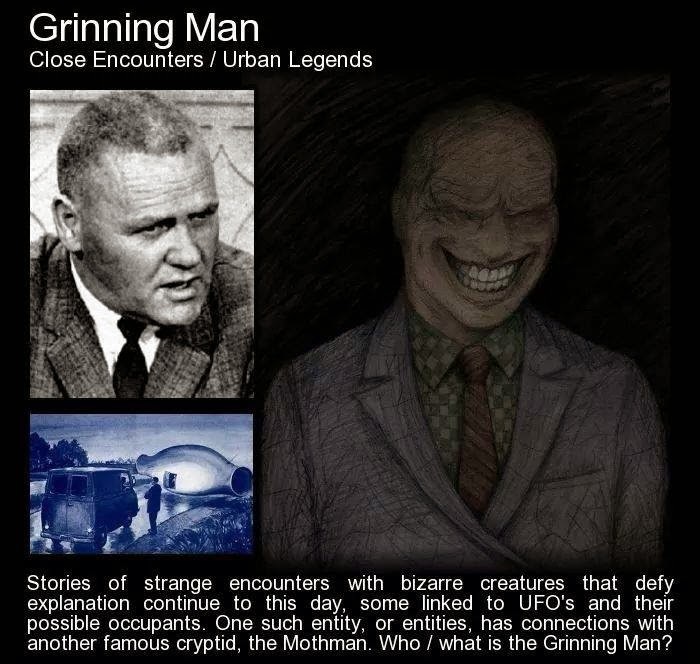 It is called, " The Grinning Man ", for in all of the encounters had with this being, one element stands out as most memorable - the maniacal grin this being has on its face when seen. The creature was first apparently encountered in 1966, according to John Keel, the paranormal investigator who would bring another famous cryptic, Mothman, to the worlds' attention. In his 1970 book "Strange Creatures from Time and Space", Keel relates what is considered to be the first recorded modern encounter with this "man" with the sinister smile. It involved 2 boys walking along a street in New Jersey in October 1966. The boys were walking in the same area that earlier that day a woman had reported being chased by a "tall, green man", and the two were nervous about the story. They were to report later that they saw perhaps the same man, standing behind a fence in some brush, looking at a house across the road from the boys. The being was behind them, and was wearing a green one-piece suit that reflected the streetlights nearby. It noticed the boys looking at him, turned and began to smile - a grin that stretched from ear to ear. Having elongated eyes, the boys could not make out whether the creature had ears, a nose or hair. That same night, miles away, reports of a "bright-white" UFO began filtering in to the police, and several officers reportedly saw the object themselves hovering near a local reservoir. Many began to claim the encounters were linked, perhaps correctly assuming the being was an alien stranded or was being sought after by the UFO. Three weeks later, a sewing machine salesman claims to have been stopped on a highway by a strange looking automobile. A man appeared from a hatch on the side of the vehicle, and a tall, bald man wearing a blue metallic suit approached the man. He could see the "man" had "slightly elongated" eyes and a demented grin that could be seen glinting in the cars headlights. The grinning man identified himself as Indrid Cold, and the two had a bizarre telepathic conversation before the entity left, saying they would see each other again. This first encounter took place in or near Point Pleasant, the area that a couple of weeks later would begin reporting sightings of Mothman, a famous cryptic said to be responsible for deaths in a bridge collapse. The salesman, Woodrow Derenberger, would go on to claim that Indrid Cold would visit him, and would reveal that he was an alien from a planet called Lanulos, situated in another galaxy. Derenberger claimed to have visited Cold on his home world,and met many other beings like Indrid Cold in his travels. He would write a book about his experiences, but would lose his job, his wife and some say his sanity in the years after., dying in 1990, some saying his obsession with his grinning friend cost him his life. Reports of "tall, grinning men" have been made in regards to night prowler incidents, where someone is seen at the foot of someone's bed, or entering or leaving a residence, and scarily sometimes even in tales of alien abduction. It has been speculated that these creatures (if its more than one being) are bizarre alien-human hybrids, aliens themselves, or a class of M.I.B. 's (Men In Black). Sceptics have argued that Keel may have invented the entity and original stories regarding it, or embellished the original tale from New Jersey to make it sound more stranger than it was in reality. Many of the sightings of this being are said to have occurred around the same time as UFO sightings, and its that supposed fact, plus the Indrid Cold stories, that have linked the Grinning Man phenomenon and UFOlogy. Main Picture: Grinning Man by TheIckyMan. Inset Lower: Drawing of Derenberger's original encounter.